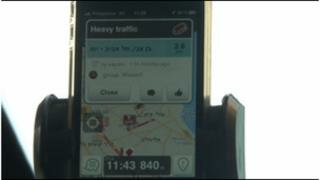 In a bid to outsmart traffic, Google has bought the crowd-sourced navigation app Waze, an Israel-based start-up. The search giant reportedly paid $1.3bn (£835m), according to Reuters, although the firm did not disclose the financial terms for the deal. The Waze app combines online maps with updates from other users about traffic jams, road works and accidents. It is believed that Facebook and Apple were also interested in purchasing the Israeli firm. The takeover could help Google improve the accuracy of its own navigation system, Google Maps. A statement on Google's official blog said the Waze team and current users had "created a great source of timely road corrections and updates". The app essentially turns a smartphone into a web community-based GPS device, bringing elements of a social network into an online mapping service, to produce more precise directions and better information about traffic conditions. Waze was founded four years ago, and now has 47 million users worldwide. The company's chief executive Noam Bardin and a few employees are based in Waze's US headquarters in Palo Alto, California, but the majority of the staff - about 90 employees - are in Ra'anana, not far from Tel Aviv.